Meet with our teams 1-on-1 to showcase your non-construction goods and services. 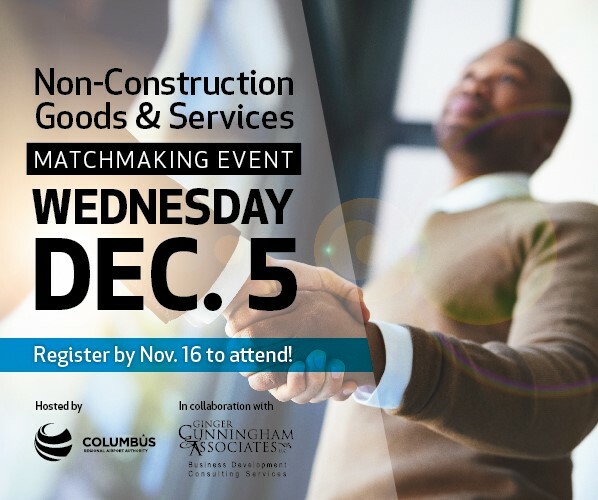 The Columbus Regional Airport Authority, in collaboration with GinGer Cunningham & Associates, invites you to our first Non-Construction Goods & Services Matchmaking Event. This outreach creates another meaningful opportunity for businesses to provide exceptional goods and services in 2019 for CRAA airports: John Glenn Columbus International, Rickenbacker International and Bolton Field. Meet one-on-one with CRAA teams of your choice during 10-minute sessions where you can showcase your business’ capabilities. Event details and registration information are noted below. We hope that you will take this opportunity to explore doing business with us! REGISTER BY NOV. 16! Time slots are scheduled on a first-come, first-served basis, so register early! 1. Review and complete the Registration & Interest Form. 2. Select the departments you wish to meet with. 3. Email the completed Registration & Interest Form to G.Cunningham@gingerllc.com. A meeting schedule based upon your selections will be forwarded to you via email.